The record is made up of 1 volume (268 folios). It was created in 1910-1912. It was written in English. The original is part of the British Library: India Office The department of the British Government to which the Government of India reported between 1858 and 1947. The successor to the Court of Directors. Records and Private Papers. Si r > ^ Constantinople, June 5, 1912.
consul at Adana enclosing a report on the Bagdad Railway in that vilayet. Enclosure 1 in No. 1. Vice-Consul Mason to Sir G. Lo wilier. Sir, ^ Adana, May 24, 1912. I am indebted for much technical matter, and from various sources since then. Enclosure 2 in No. 1. 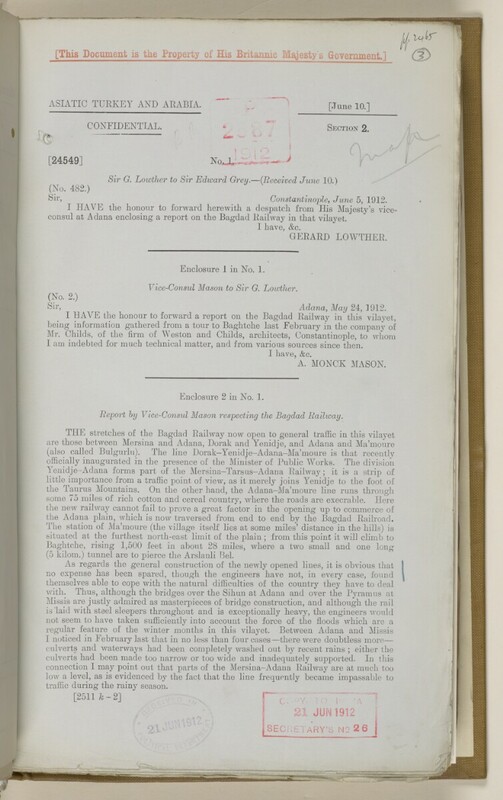 Report by Vice-Consul Mason respecting the Bagdad Railway. the Adana plain, which is now traversed from end to end by the Bagdad Railroad. (5 kilom.) tunnel are to pierce the Arslanli Bel. traffic during the rain} T season. The volume comprises telegrams, despatches, correspondence, memoranda, newspaper cuttings, maps and notes, relating to negotiations over the proposed Berlin to Baghdad Railway in the period 1910-1912. The discussion in the volume relates to the economic, commercial, political and military considerations impinging on British strategy for the international negotiations over the development of a railway to Baghdad. Further discussion surrounds the motivations and strategies of British competitors in the area; included in the volume is a copy of the Russo-German agreement. The principal correspondents in the volume include Sir Edward Grey, Secretary of State for Foreign Affairs and Sir Gerard Augustus Lowther, Ambassador to Constantinople. The papers are arranged in approximate chronological order from the rear to the front of the volume. The subject 2764 (Bagdad Railway) consists of five volumes, IOR/L/PS/10/56-60. The volumes are divided into five parts with each part comprising one volume. Foliation: the main foliation sequence (used for referencing) commences at the first folio with 1 and terminates at the inside back cover with 269; these numbers are written in pencil, are circled, and are located in the top right corner of recto The front of a sheet of paper or leaf, often abbreviated to 'r'. side of each folio. A previous foliation sequence, which is also circled, has been superseded and therefore crossed out. Pagination: a pagination sequence in red crayon is present between ff 244-252.